When blood is pumped out of the heart and traverses through the blood vessels रक्त नाळ ( rakta naala) and reach the arterioles they do not necessarily enter the capillary beds. 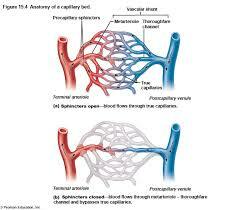 The capillaries have sphincters which act like valves. In fact the blood enters the capillaries only in certain beds at a time. When the sphincters are closed the blood is shunted or it bypasses the capillary bed traversing from the arterioles to the venules. Normally the sphincters open up when the muscles around the capillary bed are stretched. So usually in a couch potato many areas of the body may not get proper blood circulation and cell respiration through the capillaries. Usually when one moves around one uses some muscles and it facilitates blood flow in some areas where the muscles and vessels are stretched. So people who do normal work have a better circulation than one who is habitually static. If we exercise then more sphincters open and there is more complete blood circulation and cellular respiration.The exercise that are popular however are the aerobics, where a certain kind of movement is repetitive like jogging , rowing or swimming in which certain muscles in the body are exercised that facilitate good circulation to those specific areas. Of course there is a general increase in the blood pressure which helps to open up more capillary beds and thus improve circulation and cell respiration. The sketch shown below from a google search shows the capillary bed one with free flow of blood through the capillary bed and the other where the blood is bypassed without benefitting the cells. The second program will be a 50 hr program on Bhagavatgita. 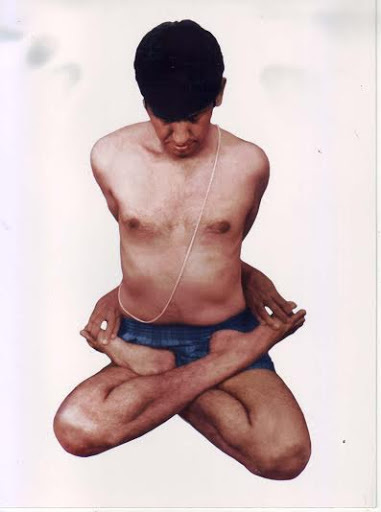 Sri Krishnamacharya was a versatile teacher. In addition to yogasanas he taught vedic chanting several texts like the Yoga Sutras, Brahma Sutras, upanishads and of course the Bhagavat Gita. He truly lived up to his given name Krishnamacharya, meaning Krishna the teacher/preceptor. His teaching of the Gita had a unique depth and flavor as he was a practicing yogi, not just an academician. In this program the Bhagavat Gita (The teachings of the Lord) will be gone through completely verse by verse chapter by chapter. It deals with the entire range of human experience and endeavors and the Lord’s guidance to everyone to go through life fruitfully and reach the ultimate spiritual state of Yoga. This program is especially designed for Yoga Students. Bhagavat Gita even as it is known as a text of Vedanta it is also known as Yoga Satra, or a Yoga text. 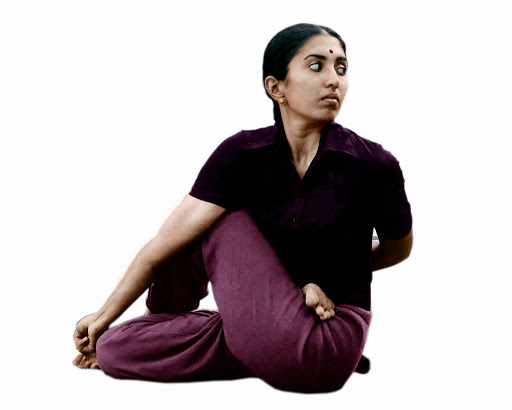 OT: Do you change the interlocking of the fingers at arm stretches over the head or headstand? Feedback: Reading your blog is fine, but I had to try stuff: I picked up the 10 daily ansanas (replaced 2), you wrote about. Pranayama and warmup was done. I hoped that daily asana could be done in less time - maybe 30-45min. But I was very wrong, because I fall in love with slow breathing and long holds. Even I did less than 10 breath, 2 rounds of Trikonasana and Pavritta Trikonasan took 12min. I tried only the vinyasa for Pascimottasana. 3 asanas where left over. After 60min had to stop exercising. Notes: Because of changing the interlocking of my fingers, I did 2 headstands for about 3min and because of stepping back (not jumping) in vinyasa I did a 2nd round of pascimottansana.